Today I bring you some nails inspired by YoungWildandPolished - and I am OBSESSED with these nails. 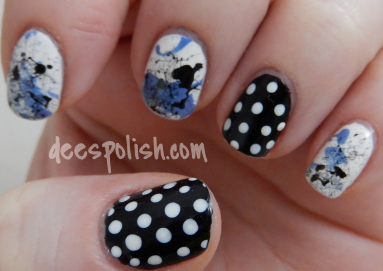 Splatter nails and dots? Yes, please. There is just something about dots and splatter nails mixed together that says 'I am very put together, but I am also a touch crazy'. Love this combo. Both splatter and dots are very easy to do.. just with splatter nails, make sure you have a good area to work with and are prepared for some clean-up.. unless you have that really rad latex stuff for around your nails. Love these nails!